Check out Kidzworld’s review of Mockingjay Part 2, part of a great 6-disc Blu-ray collection containing all four The Hunger Games films! Mockingjay Part 2 - The saga of Katniss Everdeen had many of us riveted through three novels and four films. Now available in a massive, 6-disc set, the entire The Hunger Games story can be yours at home. First, we review the Mockingjay 2 home entertainment package. With Peeta (Josh Hutcherson) still suffering from the Capitol’s mental conditioning, Katniss (Jennifer Lawrence) wonders if she will ever see the guy she knew again. 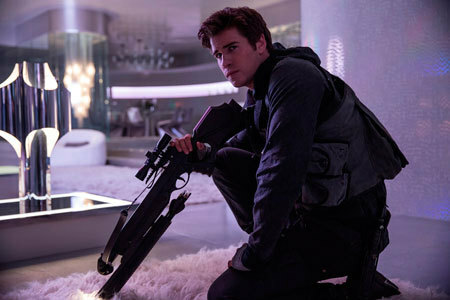 Gale (Liam Hemsworth) plans a morally questionable attack on District 2 where a vast arsenal of weapons rests. Many non-combatants will be killed but, in war, it’s necessary. 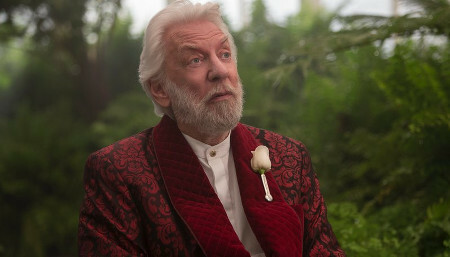 Katniss secretly aims to get to the Capitol to personally kill Snow (Donald Sutherland). 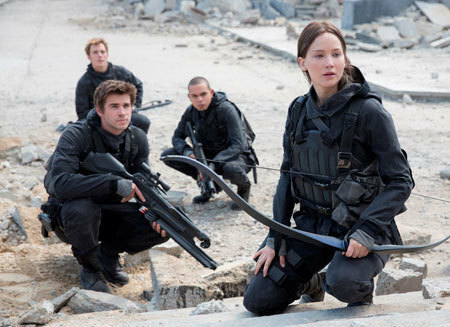 President Coin (Julianne Moore) sends Katniss and Cressida’s “propo” video team along with Finnick (Sam Claflin) and others in a squad to “fake” combat for war promotion. 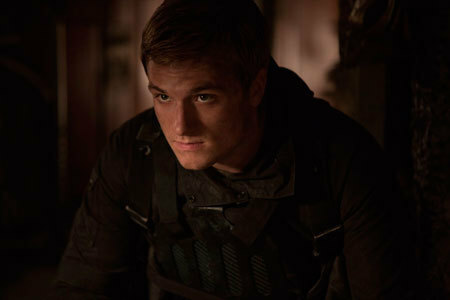 Also along is Peeta (Josh Hutcherson) who is still dangerous and unpredictable. Is he there to kill Katniss because Coin can’t control her? Having to detect and avoid “Pods”, a gamemaker’s cleverly hidden weaponry throughout the Capitol, the unit slowly makes its way toward Snow. They face a deluge of oil and horrible, sub-human “mutts” that chase them through the sewers. 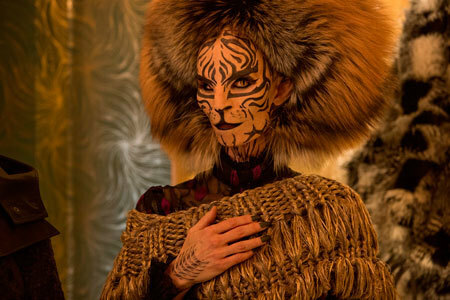 With the help of Tigress, a former stylist for the Games, Gale and Katniss regroup and dress like Capitol citizens. Gale is captured. 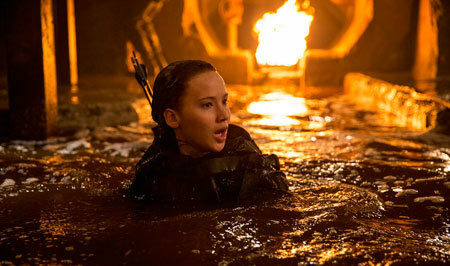 As Katniss reaches the mansion, a hoverplane drops parachutes carrying bombs that explode among a group of trapped children. 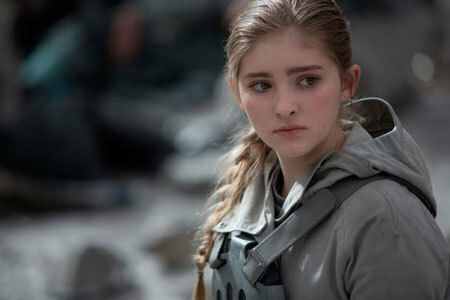 The rebel medics including Katniss' sister Prim (Willow Shields) rush in to help the injured children but more bombs are dropped killing the medics, including Prim. 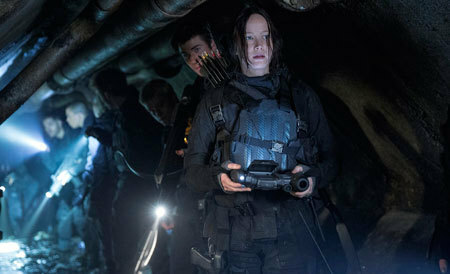 Katniss is badly burned but the rebels take the Capitol. 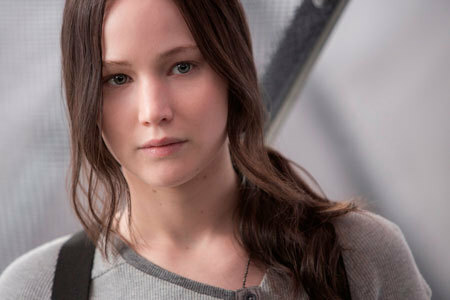 After physically recovering, Katniss, shaken over her sister’s death, confronts prisoner Snow in his rose garden. He says he didn’t order the bombing of the children or the medics. Coin did, successfully turning the last of Snow’s supporters against him. Gale sadly admits that he helped develop the bombing strategy and doesn’t know what Coin did with it. On the day Snow is to be executed, President Coin asks the remaining Hunger Games victors to vote on punishing the Capitol by holding a final Hunger Games that will target the children of the Capitol's leaders but this is just repeating the evil. Votes are taken. Katniss votes yes..for Prim. 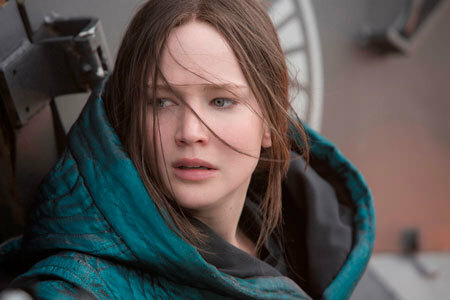 At a huge public execution, Katniss is to shoot and kill Snow. Instead, realizing that Coin is the enemy of the people, she launches an arrow that kills her instead. Snow is killed by the rioting crowd. 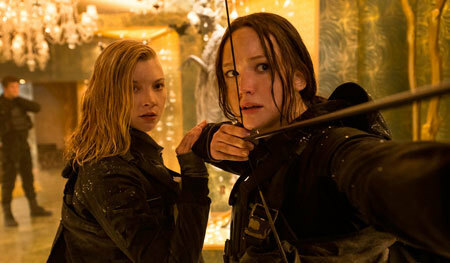 With rebel District leaders in charge, Katniss is pardoned and sent back home to her Victor’s house in District 12. 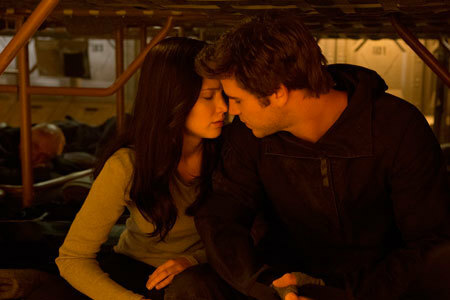 Peeta, having finally recovered from his mental ordeal has remembered his love for Katniss. The two will form a family. Audio Commentary by Director Francis Lawrence and Producer Nina Jacobson – interesting but a lot of the same info in other extras. Walking Through Fire – Concluding the Saga – The director and major actors talk about the last part of the story and where the characters are mentally at this point. Katniss is okay with dying. Splitting the last novel into two films is discussed along with keeping the production PG-13 and that it was important to end with hope. Nice. Real or Not Real (Visual Design) – This extra focuses on the special visual effects and design. We see cool concept art, on-set challenges are discussed. Good extra. High Value Targets – (The Acting Ensemble) – hones in on the actors who discuss how war and violence affects their characters. Jennifer, Liam and Josh praise each other’s work as Jenna Malone weighs in and Woody Harrelson admits he had a crush on Elizabeth Banks – very cool actor-centric extra. From Head to Toe (Costumes, Make-Up and Hair) – really great since there are so many wild costumes, extensive make-up effects and hairdos in the movie. Well worth a watch. Navigating the Minefield (Production in Atlanta, Berlin and Paris) – we see the challenges of finding real buildings matching various Panem locales. There is actor commentary here as well. Collateral Damage (stunts, special effects and weapons) –on-set explosions, motion capture-suited mutt actors, practical effects, stuntwork etc. interesting. Tightening the Noose (Post Production) – gives us details of adding in the visual effects, music and sound then editing the whole thing. An interesting filmmaking “class”. A Different World: Reflections – Cast and filmmakers look back on the end of this film.. also the end of the film series; friends made, last scenes shot, an emotional wrap party etc. Very nice personal tribute to the late Philip Seymour Hoffman as well. Very sweet. Jen says “After it was over, we all cuddled like puppies” . Also on the Mockingjay Part 2 disc is The Hunger Games: A Photographic Journey which is a beautiful collection of on set photos taken by a famous set photographer who explains his work.. very cool. You get Cinna’s Sketchbook in which the costume designers talk about details for each Mockingjay costume. There are beautiful sketches with close up details for costume fans. Panem on Display: The Hunger Games Exhibition shows us an actual travelling museum with props, costumes, holograms, games etc. introduced by Jennifer and Josh. Wrapping up Mockingjay extras is Jet to the Set, a rather lame tourist plug in which two girls take you to some of the locations. Could have done without this one. 12 never-before seen deleted scenes from The Hunger Games, 6 deleted scenes from Catching Fire with 1 new one, 9 from Mockingay Part I (some of these you may have on the other Blu-rays for those films). 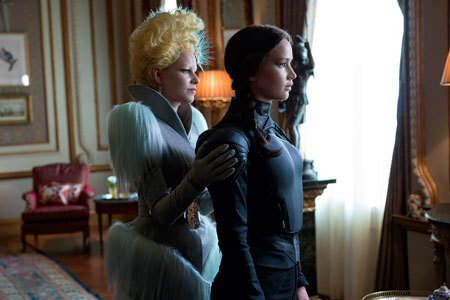 There are two all new featurettes: “Picturing Panem” and “Capitol Cuisine” that are worth a look. Audio commentaries, music videos and additional featurettes included on the original Blu-ray and DVD releases of the first three films are also included. The Hunger Games: Mockingjay Part 2 is a wonderful final film for the series, sticking close to the novel with all the heartbreak, bravery and character bonding you would want. The extras for that film are very complete, most include the actors commenting and there is a load of interesting to watch on-set action. Well worth a buy as a separate combo pack. The huge 6 disc Complete 4-Film Collection is a treasure with all the original extras included in the first home video releases plus some never seen before. It’s the perfect package for the fans of one of the best YA novel series adapted for film. We go 5 stars! Mockingjay - Part 2 is now available on Blu-ray & DVD! 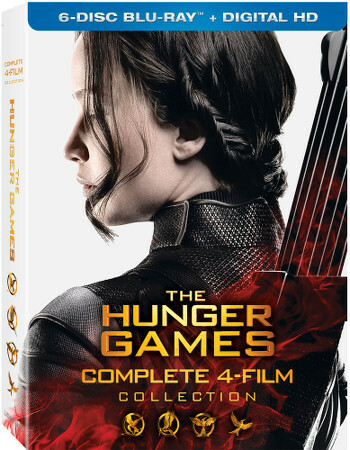 Are you looking forward to taking home all the Hunger Games films in one cool package? Which film was your favorite? Get into a commenting mood below!